The second annual Board Governance Research report on Women on Boards of Companies Headquartered in California examines the current state of board gender diversity. California made history in 2018 by becoming the first state in the U.S. to require that public companies headquartered in the state have women on their boards. Last year’s report was cited in the text of SB 826, the new law requiring women on boards of companies headquartered in California and has elevated the conversation regarding gender diversity on corporate boards across the country. New Jersey appears next on deck, but I expect the movement will soon grow to include others, such as Massachusetts, Illinois, Pennsylvania and Colorado. Board Governance Research reports may have contributed to Virginia revisiting the question of whether to become the 38th state to ratify the Equal Rights Amendment (ERA). This new report presents the findings of an in-depth analysis of the board gender diversity of 632 companies headquartered in California, which are traded on the NYSE or Nasdaq stock exchanges. This year’s report includes nearly 200 additional companies, as compared with last year. Most of the additional companies are micro-caps, with less than $300M in market capitalization. Companies this small are not typically included in board composition and governance analyses. However, these companies play an important role in the California economy and they too must comply with SB 826. Therefore, the inclusion of micro-cap companies provides a uniquely comprehensive view of board gender diversity in California. Many companies subject to the law will have to make changes to the composition of their boards in order to comply by the first deadline set forth in the bill. 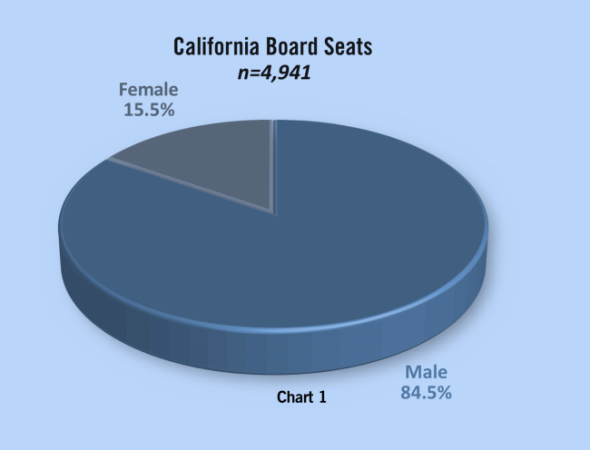 In order to meet the first deadline of December 31, 2019, nearly one-third (29%) of California companies will have to add a woman to their boards. In other words, 184 California companies will have to find and add a female director by the end of 2019. More changes to the board composition of California companies will be necessary for the second deadline of December 31, 2021. In fact, fewer than one in eight (12%) companies were in compliance with the second deadline requirements under SB 826 when analyzed for this report. This important research was generously funded by Presenting Sponsors: Radford (part of AON plc), Mintz and, Qualcomm Inc.. Supporting Sponsors: 2020 Women on Boards, Corporate Directors Forum, Deloitte, National Association of Women Business Owners (NAWBO) California, Procopio, Teresa Jacques, Board Practice Lead, Major Executive Search, Troutman Sanders and WD-40 Company. Is your company or organization missing from the list? Help fund next year’s study. Contact Annalisa Barrett, Founder and CEO of Board Governance Research.